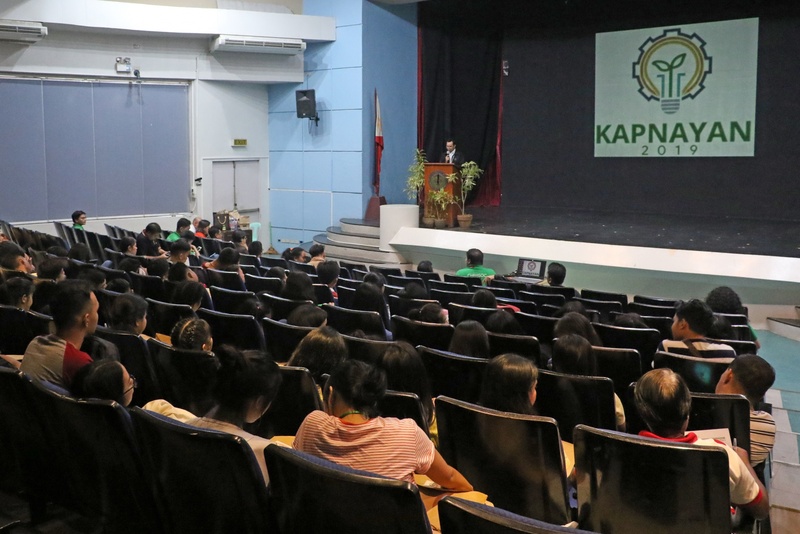 Kapnayan 2019 goes green as it emphasizes the roles of green chemistry and renewable energy in sustainable development. Kapnayan, the chemistry fair that the UPLB Chemical Society has been organizing annually for high school students, integrates these emerging fields in its line-up of activities from Jan. 14-19. Its opening ceremony on the first day that was held at the NCAS Auditorium featured talks from the development and business sectors. “Promoting green chemistry and renewable energy is among the solutions to one of the key challenges today,” said Engr. Luis Banua, regional director of the National Economic Development Authority (NEDA)-Calabarzon, who read the message of NEDA Assistant Secretary for Regional Development Mercedita Sombilla. “Promoting green development is very relevant in our thrusts and strategies under the Philippine Development Plan,” Engr. Banua added, citing green manufacturing, sustainable production and consumption, and intensified use of renewable energy as among the practices that should be encouraged and incentivized. Green chemistry, according to www.nature.com, moves “towards environmentally friendly and sustainable products and processes.” Renewable energy, according to Engr. Banua, has been instrumental for Calabarzon to contribute 60% of the energy requirement in Luzon with the geothermal, hydroelectric, solar, and wind power plants and facilities in the region. The other speakers, Ariel Miranda, managing director, and Meden Peneyra, laboratory operations manager of SGS Philippines, Inc., talked about the various applications of chemistry in the multi-laboratory testing capabilities industry. Peneyra, a UPLB chemistry alumna, discussed the application of chemistry in SGS Philippines’ food, microbiology, instrumentation, environmental, minerals, and non-food chemical laboratories. She also shared to the audience the company’s sustainability efforts through energy efficiency practices and proper waste disposal. Kapnayan 2019 has brought together around 300 high school students from all over the country, who took part in the opening lecture and will also join the series of contests in the coming days. These include the nationwide chemistry quiz, extemporaneous speech, essay writing, investigatory projects, photo, and poster-making competitions. Seminars, exhibits, educational tours, and nature trips are also part of Kapnayan 2019, which has been promoting chemistry appreciation since 1976. According to Dr. Portia Lapitan, vice chancellor for academic affairs, who delivered the opening remarks on behalf of Chancellor Fernando C. Sanchez, Jr., Kapnayan 2019 plays a role in raising awareness about sustainability issues.